Mario Kart Deluxe 8 on the Nintendo Switch has become the first game to work with the Nintendo Labo cardboard accessories outside of the Labo’s own software. With a free update to the popular game, which is available from Tuesday, players will be able to assemble and use the motorbike Toy-Con to control their racer in the game. Users can place the Switch’s detachable Joy-Con controllers into the motorbike and play on their TV, or remotely with the Switch screen slotted into the Toy-Con. Until now, only the built-in games linked to each Labo creation worked with the cardboard toys. 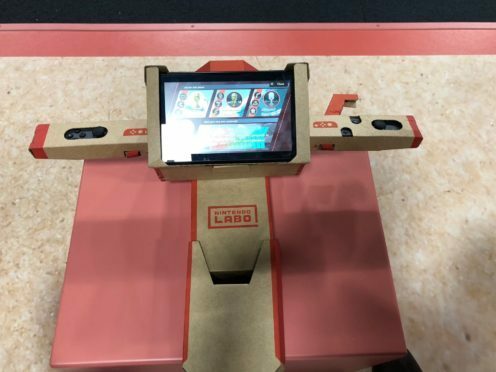 Labo was released earlier this year as Nintendo’s new line of interactive gaming accessories that players build out of flatpack cardboard before fitting together with their Nintendo Switch console to create new gaming experiences. As well as building and playing pre-loaded games, users can also use the Labo’s Toy-Con Garage to code and create their own custom experiences. As well as confirming Mario Kart’s new marriage with the Switch, Nintendo also revealed it did plan to bring more games to the Labo in the future.